Spring Is In the Air and Pitchers Are Everywhere! Ahhhh, baseball weather. Ok, maybe not quite, but believe me, Spring is in the air here in Central Florida. While Braves pitchers & catchers will officially report on Friday, this morning the ESPN Wide World of Sports complex was buzzing as 15-20 pitchers were already out playing catch in a light rain in right field at Champion Stadium. The first hurler to stand out as I entered the complex is Luiz Gohara. The 22 year old southpaw spent his offseason training here in Central Florida in hopes of shedding some weight and more importantly, having a normal offseason. A year ago, Gohara had to deal with the sudden loss of his father, his mother being ill back in Brazil and a couple of nagging injuries that limited him to just nine Big League appearances (13 total between AA and the Majors). Gohara is an intriguing name to keep an eye on over the next six weeks. 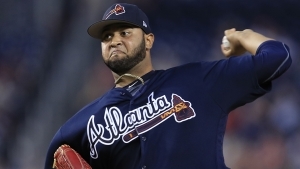 With an electric fastball that can touch triple digits, sharp slider and occasional changeup, Gohara will find himself competing for either a spot in Atlanta’s rotation, or quite possibly, a role in the bullpen. For as hard as he throws, walks have typically not been an issue for Gohara coming up through the minors. Another plus when you’re talking about a possible late inning arm. In my opinion, he’s also flying a bit under the radar coming into 2019. A year ago, I expected him to make a strong case to break camp in the starting rotation. But injuries wiped those hopes away rather quickly. With guys like Touki Toussaint, Kyle Wright, Bryse Wilson and others all competing for what essentially amounts to one spot, Gohara could be in prime position to be a darkhorse candidate. But, he’ll have to prove he can stay healthy to have any chance of heading north with the team in six weeks. Kevin McAlpin has covered the Braves since 2012 for @680TheFan and the @BravesRadioNet.